Click on the Notifications icon in the main menu to see what was going on in Productive. You'll get a list of all the things that need your attention. To dismiss a notification click on the X button. 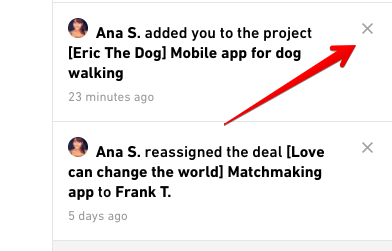 When there's a lot of activity on the same project or a deal a bunch of notifications will be stacked in one. You can see the number of activities in the notification. Click on the menu to access more options. 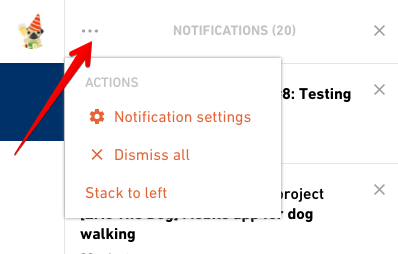 Stack notifications to the left or right side of the screen. Notification settings open up a screen where you can set up receiving e-mail notifications. Dismiss all clears the list of all the notification which means you can go ahead and open up the champagne. If you want to disable Productive from sending you push notifications, you can do this via Settings in your mobile phone. Unlike email notifications, mobile notifications are turned off via mobile phone settings, not inside the Productive app itself. Go to Settings> Notifications> Productive app> Allow Notifications and turn off the notifications. Go to Settings > Apps> Productive app> Notification settings > Allow Notifications and turn off the notifications. Unlike email notifications, this will disable all notifications from Productive being displayed on your mobile phone.